DAVAO CITY — Cebu Landmasters, Inc. (CLI), through its joint venture firm YHEST Realty and Development Corp., is looking at borrowing P2.5 billion for the first phase of its P33-billion Davao Global Township project. Jose R. Soberano III, CLI president and chief executive officer and YHEST chair, said while the company currently has enough funds for the initial P10 billion needed for phase 1, there have been several loan offers from financial institutions. “To a certain extent possible, of the P10 billion for the initial phase, maybe 25% of it maybe borrowed,” he said during Friday’s unveiling of the project design. “There are those (lending institutions) that are knocking on our doors. But since at this stage we have yet to need more funding, we are just doing our internal (funding) generation. We will have enough time (to secure more funding),” Mr. Soberano said. He added that they are also currently pursuing purchase deals for adjacent properties to expand the project to 30 hectares. The township, which broke ground in November 2018, is being developed on a 22-hectare area that used to be a golf course. The first phase, targeted for completion by 2022, covers the construction of a corporate center, two premier residential towers, a retail strip with a cineplex, outdoor retail shops, and a civic center that will be named the DGT Gallery. Part of the corporate building is being offered to the De La Salle University for a graduate school. YHEST President Frederick H. Yuson said they are now finalizing the deal with the university. CLI Chief Operations Officer Jose Franco B. Soberano, meanwhile, said about 40% of the township’s area is envisioned to be open spaces, including a park that will be open to the public. “It’s a very generous ratio. There will be sidewalk cafés, wonderful views, space for walking and jogging. We will make sure that there will be more trees… It is a former golf course with so much to remember about it from the past,” said Mr. Soberano, son of the CLI president. “It is a commitment of the company for the people of the city,” he added. The elder Soberano added that they are exploring the possibility of including a bulk water source component into the project, which they will be discussing with distributor Davao City Water District (DCWD). “We will not take away the water needed by the city but we will provide more water. We’re not officially talking about this with DCWD but this is something that we want to explore to address the matter of providing water… But all of this will have to follow regulations and we will have to make necessary permits from the National Water Resources Board and the like,” he said. “This is a real addition to Davao City and this can only happen with all the conviction that we will be putting together in terms of sustainability,” he added. 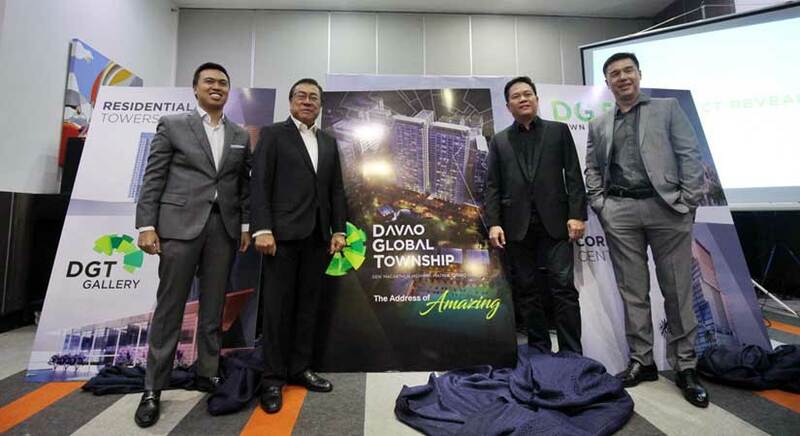 The Davao Global Township is the third and biggest project of CLI in partnership with YHEST Realty, a group of the Yuson, Huang, Tan and Villa-Abrille families of Davao City. The other two are the Messa Tierra condominium and the mixed-use The Paragon Davao.